New luxury vinyl flooring installed through out condo September 2017. This villa was been renovated in 2015 including painting, new appliances. Remodeled master and guest bathroom with new tile showers, floor, glass doors, plumbing and cabinets 2018. The unit is situated in a more quiet setting overlooking the lagoon, golf course and wooded areas with wildlife and alligator viewing. The condo was upgraded with new wireless high speed internet connection and HD TV, which is free of charge. 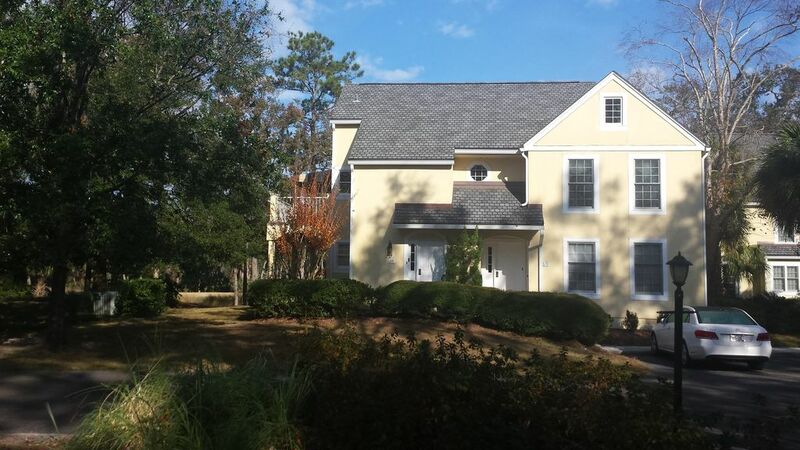 The master bedroom has a king size bed, ceiling fan, walk in closet, TV and DVD and overlooks the lake/golf course. The guest bedroom has 2 twin beds, large closet, rollaway bed, TV, VCR and ceiling fan. The family room has a HDTV DVD, ceiling fan, a queen sofa bed, lazyboy chair, fireplace, and wet bar. A laundry room includes a washer and dryer. The 2 bathrooms are full baths with tub and shower. There is a deck that overlooks the golf course and lake to relax and watch the birds, turtles and alligators and enjoy the outdoors. New adirondack chairs and grill. A private pool and tennis courts (lighted) are located just up the street from our unit (1,000 ft.). A large lake and gazebo is next to the pool area and is also available for fishing. Bike and walking paths are located throughout Hilton Head/Shipyard. Note: Alligator viewing is a special attraction, but do not feed them or get close to them. The beach is approximately 3 blocks away and short bike ride, walk or you can drive to the Shipyard private beach area. Our family is from Northern Kentucky, just south of Cincinnati, Ohio. Our family of four have been coming to Hilton Head since the mid-1980s. We love the weather, beach, pool and biking/walking in Shipyard or on the beach. Evian is a private community, low density and very relaxing. Our villa overlooks a lake and the 9th hole of the Shipyard Golf Course. The side yard has nice trees and landscaping and wildlife viewing is great from our deck. Very clean and keep property updated. View and open area in our side yard is unique to this property in Evian. Very relaxing just sitting on the deck and watching the wildlife. Unit uses heat pump for both heating and air conditioning. Installed new clothes dryer in 2010. Convenient, in private parking lot just outside front door. Free DSL direct or wireless connection. Towels provided with cleaning service, including toilet paper and paper towels. New Whilpool automatic dishwasher. Dishwashing detergent provided for weekly renters. Toaster oven, blender, electric can opener, griddle, electric outside grill. All included in kitchen cabinets. Board game in kitchen under bar area. Side yard is open and unit landscaped. rentals available at local marinas, including ski doos. bicycle rentals are available from several local companies. Bicycle Co., Pedals, and Billy's Bicycle Co.
Second floor great view of lake and golf course. Located just off dining room and kitchen area. Free in Evian; has 8 courts, 4 of which have lights. Van Der Meer Tennis club and training facility is located next to Evian in Shipyard. Locally Shipyard Golf Course is closest. Golf guide available for all courses in area some 15 courses. Large pool with lounge chairs and local restroom for residents of Evian. Clean, convenient to all areas on the island, nice bike ride to the beach, nicely furnished. This property feels secluded and private but is near the beach and pool, and convenient to everything on the island. Coligny is a bike ride away. The villa was as shown in the photos — even better! It’s roomy, well-kept, nicely furnished, easily accessible with front-door parking. Evian is quiet and beautifully landscaped with lots of shade. The pool is within walking distance. The owner responded almost immediately to my questions. We will return to this villa. This is a great location with everything for a perfect family vacation. Loved using the pool which is so close to the property and easy access to the beach. Dennis was very responsive to all issues (dryer quit working while we were there and housekeeping was still cleaning when we arrived at check-in time). He greeted us with a phone call to alert us to the dryer issue and apologized for the cleaning crew mishap (although we had already arrived and had started a load of laundry to wash clothes that got wet on our rainy drive there). However, he offered to pay for the cost of using the laundromat and made us feel they really wanted to do their best to have us enjoy our stay. The place was clean and roomy enough for the 6 of us, although be cautious--the stairs up to the living area are a little steep for an old worn out person with bad knees like me. Kitchen was well-stocked with utensils and that was a huge plus for us as we do a lot of cooking! The master bed was very hard compared to what me and my husband are used to. If we had any recommendations to the owners, it would be to consider replacing that mattress. Highly recommend renting bikes for the week and biking the island--driving around the island can be a nightmare, but the island is beautiful and well worth seeing! The beaches are lovely, although it's a bit of a jaunt to the beach on foot from this villa--we rode bikes and drove a car only to unload our stuff, then parked back at the house as parking was very hard to come by! Ask for directions until you get the lay of the land--the residential area that this villa is in can be quite complicated to manuever around until you become familiar with it. It was so cool to see alligators in the pond areas and the community pool was very nice! All in all, we greatly enjoyed our stay and hope to visit again soon! At the cost of having only limited access in the future, let me say this place is one of, if not the best places I've had the opportunity to use during my many, many vacations to HH. Everything looked new and was well appointed. Loved the balcony. Can't say enough good about 271. Now I wonder if I'll get the opportunity to revisit because this review will direct others to the villa and I'll be forced to seek shelter elsewhere. Really a fine place to stay IMHO (and the five others that stayed with me). This is the third time I have stayed at 271 Evian and it was just as clean, beautiful, and relaxing as I remembered. Even at the height of the season, the small complex was quiet and peaceful. The beach is a 5-minute bike ride and the convenient "beach parking pass" for the car is wonderful for those of us who need to more than a bike may hold. This is our new Family Vacation Home and we thank VBRO and the owners for sharing their joys with us!